Is the market big enough for two similar players? Need a ride? 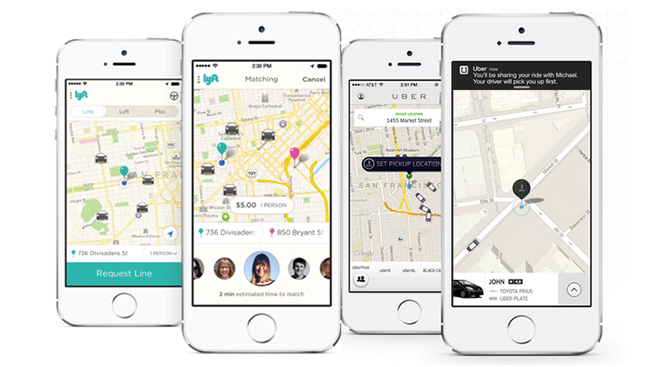 Car service tech startups Lyft and Uber are launching eerily similar rideshare programs. Lyft Line will match riders who use its app and are traveling in the same direction. Lyft claims that 90 percent of its users request the same journey within five minutes of their trip. Not only will the service help save the environment, but a carpooled trip will cost up to 60 percent less than a single customer ride. The service launched on Wednesday on iOS in San Francisco, with other cities and Android to be added later. Like Lfyt Line, UberPool will connect app users heading in the same direction. The new service, which starts broader beta testing on Aug. 15, can save users up to 40 percent off the cost of the traditional service. And, even if UberPool can't find you a travel buddy, it will offer an undisclosed discount. Currently, UberPool is being tested privately by Uber and Google employees. While Uber, which is valued at $17 billion, is the larger of the two car service apps, both companies have been plagued by the same legal troubles in some areas that bar unlicensed transportation providers. For example in Miami, where the battle has become especially heated with the taxi commission, Uber offered free rides for the first 15 days of its service. Lyft covered the $2,000 fine and impounding fees for any driver who was caught working for them, according to the Miami Herald. But, the tide may be turning. Miami-Dade County commissioners voted to relax their rules against the companies in mid-July. Also, Virginia state officials said today that they have negotiated terms that will allow both services to operate while guaranteeing rider safety and help licensed transportation service providers not lose too much business. "For Virginia to remain economically competitive, it is important that we welcome innovative companies like Uber and Lyft and provide them with the resources they need to safely and effectively operate in the Commonwealth," Virginia governor Terry McAuliffe, said in a statement. "Technology— specifically related to smart phones—continues to advance at a rapid pace, and I am pleased that we were able to work together to find a swift solution that will provide Virginia’s workers, students, and families with more transportation options."